Odebrecht investigation is moving like avalanche through the world and hitting diverse collection of victims. This month in Peru it hit a president and the largest Chinese investor. Peruvian President Pedro Pablo Kuczynski, implicated in a corruption scandal involving Latin America’s largest construction firm, announced his resignation on March 21st. Likely Kuczynski had nothing or very little to do with the bribing monster, at least in comparison with other politicians. For example, Peru’s former President Ollanta Humala and his wife are in prison while authorities investigate their involvement with Odebrecht. 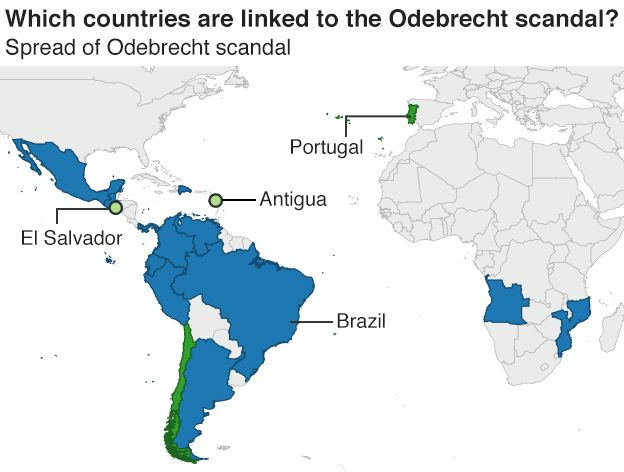 In at least 15 countries Odebrecht was financing political campaigns and providing other personal favors to politicians in exchange for large state contracts for mega-infrastructure, hydropower dams being the central theme of the scandal. For example in Angola, the firm just completed a 2 GW Lauca Hydro. Most exquisite victim of the scandal in Peru is our old acquaintance – China Three Gorges Corporation. Being heavily indebted and in great need of case the Odebrecht SA agreed in August 2017 to sell the 500MW Chaglla hydroelectric project to China Three Gorges Corp. The deal was supposed to close by Feb. 23 but has been on hold for months as the government decides how much of the proceeds to keep as a penalty and how much will go to Odebrecht, the Brazilian builder that’s embroiled in a global corruption scandal. It passed a law that year to retain part of the proceeds from asset sales by companies that have been involved in illegal activities, preventing Odebrecht from transferring money abroad without government approval. A key issue is that the existing law doesn’t specify the amount, and prosecutors have proposed slapping Odebrecht with a penalty of as much as $1 billion. There’s a new version of that law under debate that would set the charge at 50 percent of the proceeds. That’s about $300 million for Chaglla. Odebrecht and Three Gorges have asked the government to reduce the charge to 30 percent. There is a crisp irony in the fact that the CTGC, once known for its own rampant corruption, now is suffering from corruption scandal created by its Brazilian counterpart. Before the scandal, Odebrecht had more than 180,000 employees in 21 countries and revenues of more than $40bn. By 2016 revenues had dropped to $26bn and staffing numbers had dropped to less than 80,000. The investigations have even contributed to economic downturn in Brazil, and Peru shaved almost a point off its growth forecasts for 2017, which the government blamed on "the Odebrecht effect". The word “Odebrecht” is destined from now on to become a noun or a verb indicating extreme scale of corruption.